Home / Latest Post / Politics / Pride / Public Interest / Myanmar Operation – Why The Frauds Are Crying? Myanmar Operation – Why The Frauds Are Crying? Leading up to the 2014 general elections, in one of his campaigns, Narendra Modi said to the then dispensation – “Chullu Bhar Pani Main Dub Maro”. Do you remember that statement and the context in which Modi said so? The statement was with respect to the beheading of our two BSF soldiers by the Pakistani rangers without any reason and provocation. What was the response of our then government against this showcase of barbarism of our neighbors? Complete silence would still have made some sense but surprisingly AK Antony stood on the well of the house and started defending the Pakistanis. There were terrorists dressed as Pakistani Rangers who are responsible for this ghastly act, he elaborated. And I am sure, such comic conclusions came without any investigation whatsoever because Mr. Antony jumped to his conclusions in about twelve hours. Was this statement of the then defense minister reflects any kind of concerns of the state for our brave soldiers who defend our land with their sweat and blood? At least I don’t see any. Now look at the contrast within a year after Modi took charge of the nation. On June 4th a group of militants ambushed an army convoy and killed 18 of our soldiers. What was the immediate response of the state? Manohar Parikar while addressing the media the very next day said – We have a strong 1.3 million army, not to preach peace. That statement itself showed that this time around we don’t have jokers in the cabinet who give priority to their vote banks over national pride and national security. 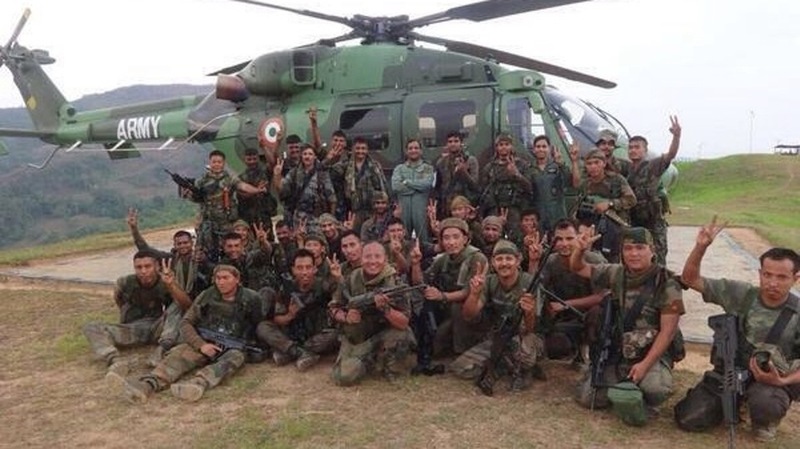 Action followed the words and within five days, a special group of Indian commandos, in a covert operation, did a hot pursuit of the rogue elements and killed more than 150 of them inside Myanmar borders. A first of its kind that we accomplished. That is what you call revenge for the grisly act perpetrated four days earlier. No ifs, no buts but to stand up and take avenge for the deaths of our brave hearts. To top it, not a single casualty on our side during this operation speaks volume of our army’s professionalism and valor. In fact, our army’s capabilities were never a question mark. It was the weak-kneed and coward leadership that never had the courage to take such strong steps. It is only this political cowardice that always hampered the morals of our armed forces. For every damn attack on our army personnel, our shameless leadership in Manmohan Singh and down used to search for an excuse to do nothing. And, that excuse most of the times was the unconditional love for their vote banks, though never been admitted in as many words. Before the Pakistani army could defend itself, we had reprobates on our side that used to start the advocacy with full vigor. Remember the statement of Napoleon – an army of lions led by a ewe amounts to naught. This was precisely the case when Dr. Singh and his bunch of louts were ruling. Now things have changed and changed for good. Now we have a leadership that knows how to pay back in equal terms if the need arises. 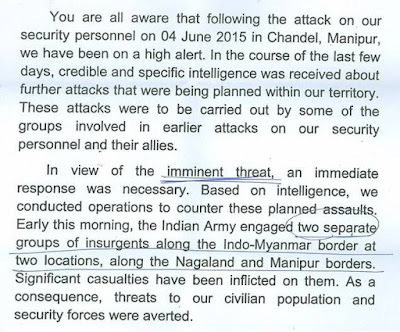 First thing the government did after the attack was to send NSA Ajit Doval immediately to Manipur and stay put there. The intent to salvage the depleting moral of our armed forces after prolonged impotency of our leadership was so prominent that AD never accompanied Modi on the trip to Dhaka, which had significant security angels on the table. Our foreign secretary S. Jayshankar visiting Myanmar within 24 hours of the incident also showed the intent of the present government. 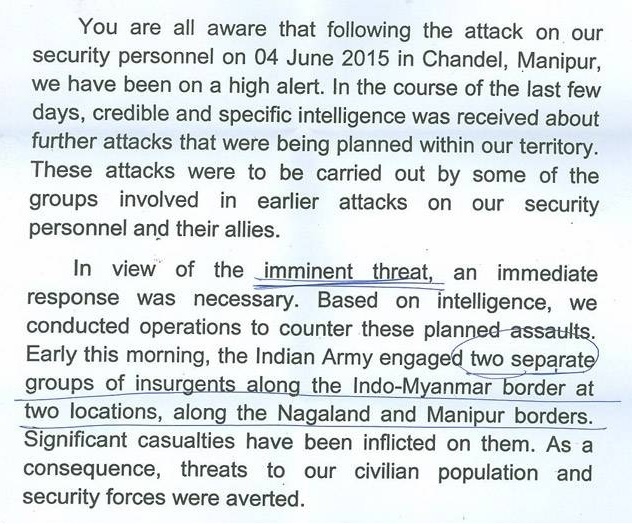 This particular press release of our army after the operation sums up everything, including the no-nonsense attitude of this government when it comes to national security. Earlier, our armed forces were directed to keep quite after every misdemeanor of our enemies which now has changed to freehand in dealing the way a highly capable army should do. The army is same so as our borders while one thing has changed and that is kicking out a highly impotent, incompetent and spineless colony of judders, for whom the nation mattered nothing. Anyone with a vested interest would attack our army, be it the cross border terrorists or the internal problematic Maoists. The attacks would happen time and again. Rather than acting decisively our charlatan governments would preach peace as if all are direct disciples of his holiness the Dalai Lama. No concern was spared for the deteriorating moral of our army. Every time, in the name of diplomacy (read incompetency and vote bank), our army was asked to behave like quitters, still being capable of dealing with worst of enemies swiftly. What Modi government achieved with their latest bravado of answering back squarely is restoring the faith in our armed forces that there is finally a government which means business and is serious about the nation and those who protect it. But the Congress fraidy-cats are far from recognizing the fact that there isn’t a coward mute spectator that is heading the government anymore. That is perhaps why they thought to refute credits to Modi but drag it to 2010 when they supposedly sign some agreement with Myanmar. I even don’t blame them. When a priminister can go to Sharm el-Sheikh and shame the pride of an entire nation with the kind of joint statement he made with his Pakistani counterpart, it hardly remains confusing on the priorities that Congress always stood for. Problem is the priority list of Congress, though stretched too far; it never had ‘national pride’ in their list. They only know how to jump like a cat on a hot tin roof on some stray statements of Modi but would try to defend Pakistan for each of their distressing acts on our armed personnel. Sonia Gandhi would rush to Chattishgarh and threaten Dr. Raman Singh for the Maoist attack on a Congress convoy but one would never hear her speak a single word on the departed soldiers. That said none should expect much from Congress for our armed forces. A party which covertly allows its men to loot from a housing project, specifically developed for the war widows, it shouldn’t surprise us at all if the same party goes ahead and shames the same force time and again for personal gain. Had Congress been serious about the respect and wellbeing of our brave hearts they wouldn’t have allowed Ashok Chavan, an Adarsh Scam accused, to fight his election on a Congress ticket. This itself shows the rotten attitude of a highly surreptitious party towards our armed forces. Congress even has this bad habit of insulting our martyrs. How many in Congress thought of visiting the widow of Police Inspector Sharma? But look at the contrast. A rotten potato like Digvijay Singh visited the terrorists in Azamgarh at least three times. Congress may call those visits of Digvijay Singh as his personal choice but we know what the facts are. Other than distancing from Digvijay Singh, no one in Congress ever thought of sanitizing a man who is a routine offender of our martyrs. Has anyone ever seen Sonia Gandhi asking people like Digvijay Singh to measure their steps when it comes to protecting the dignity of our armed forces and martyrs? At least, I never had that privilege of seeing a critical Sonia Gandhi towards Digvijay Singh or anyone else. But this is India, where we have a lot of louts who exchange our national pride, either for cheap publicity or easy money. I dare to even imagine if the republicans would question the intent and castigate the Obama administration for taking stern action against Osama Bin Laden. Did anyone hear a single politician or scribe in USA getting critical after Navy Seals raided the compound in Abottabad? But as I said, we are Indians and we have different parameters when it comes to national interest. That is precisely the reason why we have morons like Praveen Swamy who write in length to prove how attacking the enemy of the state is futile. That is perhaps why presstitutes like Sekhar Gupta compile nonsense in a program in NDTV, till the point the audience opposes his erratic benevolence towards the terrorists with strong counter words. But these Praveen Swamys and Sekhar Guptas are darling to the Congress party. They are routinely fed with Padma Awards for their service to the party. They always remain in the good books of Congress and even in the good books of the proved ISI leeches like Mr. Peerzada. No surprise why Mr. Peerzada bestowed all encouraging words on Praveen Swamy post his literature in Indian Express. Not only that, Mr. Peerzada also assured Swamy some rewards for his good work in castigating his own country with baseless arguments. After all, an enemy would always love a mole in his opponents stable. Love from Pakistan, Mr. Peerzada said to the great Praveen Swamy. And by the way, the rewards are on their way, as per Mr. Peerzada’s tweet. But this is not the first time. Exactly same happened during the terror boat farce. Rather than appreciating the intent of our government in protecting our boundaries, we had lots of Rudalis who went to the town in criticizing the government along with our coast guards. In first of its kind, the jerks in Congress felt, we should have let the boat cross over to our waters as they did during 26/11. And as usual, we had these same Praveen Swamys and Sekhar Guptas who just kept crying endlessly for the occupants of that boat as if the imminent danger to our country from the sponsored terrorism of Pakistan doesn’t count much. The same morons also cry when the state refuses to issue passport to someone like Geelani. Sekhar Gupta, in an attempt to outplay most of the other Rudalis, loses his mental composer and attributes a passport as the fundamental right of an Indian citizen and how the Modi dispensation is curtailing the fundamental rights of a holy soul like Geelani. Ditto is the case with our paid media. They cried profusely during terror boat and they cried again for the barbaric Myanmar operation. They even went a step ahead and asked if our commandos really killed anyone or not? Refer the tweets of Rajdeep Sardesai during that time and the nefarious nexus of our media morons with anti-India elements would be clear. All in all, it seems, a lot of left liberal frauds are feeling jittery post Myanmar covert operation. Remember my saying? The moment you see these frauds, the litfest mafias, the idea of India clowns up in arms synchronously, you know, you just did something right. First of all good article. To add on to your points, when ExCol Rajyavardhan Singh Rathore spoke with Arnab gowswamy, he said in generic statement that any neighbor who is threat to integrity to our country will be handled with firm action. Then, Arnob went on to ask specifically if he means Pak and then Rajyavardhan said it means to all who are threat to Indian integrity. Next day all congis were going gaga on his statement. So much so that pak ka najayaj kutha (parvez) also issued some nonsense statement. Honestly, I don't see credible evidence to suggest Pak having customized nukes to begin with. Knowing the beggars, I won't be surprised if US have all the control of their nukes a long time back. "The moment you see these frauds, the litfest mafias, the idea of India clowns up in arms synchronously, you know, you just did something right." - very true. "Why The Frauds Are Crying?" - Because the scoundrels know that stronger and safer India means lesser and lesser power/vote bank/money for them.